by Bloom, Lynn Z.; Smith, Louise Z. What do you look for in a thematic composition reader? Certainly classic essays that every student should read, as well as fresh selections that showcase some of the best new writing; plus an array of engaging themes that point toward the disciplinary thinking and writing students will have to perform as undergraduates; and helpful support that moves students from critical reading to thoughtful writing to using sources and revising. 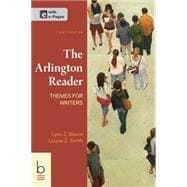 The Arlington Reader: Themes for Writers offers all this—and more. It is the least expensive and most manageable full-service thematic reader on the market, with a price students can afford and in a size they'll be happy to carry in their backpacks. The fourth edition includes a substantial new mini-rhetoric, with three full chapters of critical reading and writing process instruction, as well as new topics and readings that will challenge students' assumptions and spark considered writing. The print text is now integrated with e-Pages for The Arlington Reader, designed to take advantage of what the Web can do. Lynn Z. Bloom is Board of Trustees Distinguished Professor and holder of the Aetna Chair of Writing at the University of Connecticut. Previously, she taught and directed writing programs at Butler University, the University of New Mexico, and the College of William and Mary, and she chaired the English department at Virginia Commonwealth University. Bloom’s publications include composition studies, biography, autobiography, creative nonfiction, poetry, reviews, articles, book chapters, and textbooks. Her numerous books range from Doctor Spock: Biography of a Conservative Radical to The New Assertive Woman to her current works, The Seven Deadly Virtues and Other Lively Essays and Writing and Teaching Writing in Troubled Times. Louise Z. Smith is Professor emeritus of English at the University of Massachusetts, Boston, and former Dean of the College of Arts and Sciences. A member of the faculty there since 1974, she also served as the Director of Freshman English; Chair of English; Director of the Tutoring Program; and Director, Core Curriculum. In addition to the many articles and book chapters she has written for publication, Louise Smith was the editor of College English from 1991 to 1999.